From the towering portico and stunning stucco and stone exterior, to the three-car garage and elegantly appointed rooms, this home plan commands respect and attention in an elegant manner. Casual gathering spaces are plentiful, with the spacious hearth and great rooms, and each feature a fireplace. 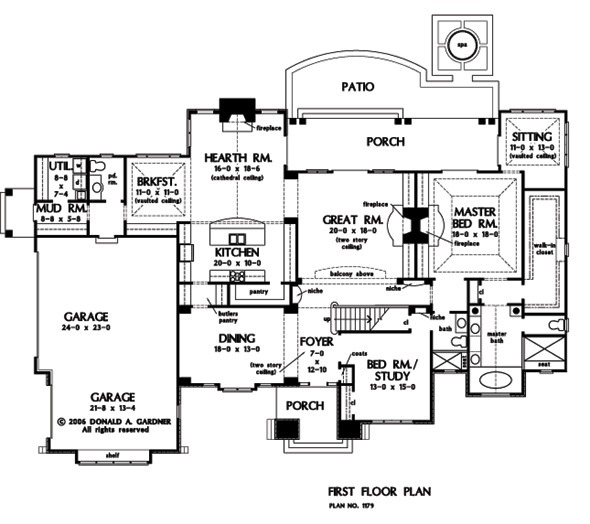 A vaulted ceiling crowns the breakfast room and master sitting area of this house plan, while the two-story great room features a balcony above. The master bedroom also has its own fireplace and features rear-porch access, along with a luxurious master bath. 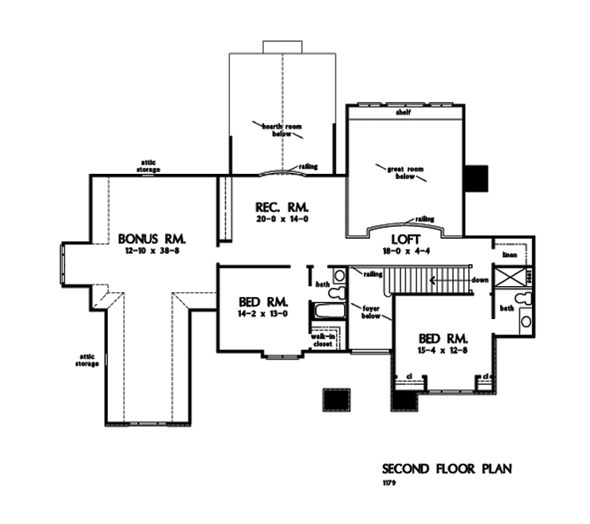 The first-floor bedroom/study makes an ideal home office or guest suite with nearby full bath. Upstairs in the home plan, two secondary bedrooms each have their own bath, while the rec room and bonus room provide space for kids and adults to each create their own getaway place. For families who love space and privacy combined with elegance, this is home. 1st Floor: 3187 Sq. Ft.
2nd Floor: 1091 Sq. Ft.
House Dimensions: 96' 0" x 62' 4"
Master Bedroom: 18' 0" x 18' 0"
Loft / Study : 18' 4" x 4' 4" x 8' 0"
Master Bedroom : 18' 0" x 18' 0" x 13' 0"
Mud Room : 8' 8" x 5' 8" x 10' 0"
Other : 12' 4" x 2' 4" x 4' 2"
Porch - Rear : 36' 4" x 9' 0" x 9' 9"
Porch - Front : 10' 8" x 9' 0" x 19' 6"
Porch - Left : 5' 0" x 8' 4" x 10' 0"
Rec Room : 20' 0" x 14' 0" x 8' 0"
Storage (1st Fl.) (Sloped): 3' 4" x 4' 0" x 0' 0"
Utility Room : 8' 8" x 7' 4" x 10' 0"
Bedroom #3 : 14' 2" x 13' 0" x 9' 0"
Bedroom #4 : 15' 4" x 12' 8" x 8' 0"
Bedroom / Study : 13' 0" x 15' 0" x 10' 0"
Bonus Room (Vaulted): 12' 10" x 38' 8" x 8' 0"
Breakfast Room (Vaulted): 11' 0" x 11' 0" x 13' 0"
Dining Room : 18' 0" x 13' 0" x 10' 0"
Foyer : 7' 0" x 12' 10" x 19' 1"
Garage : 21' 8" x 36' 4" x 0' 0"
Great Room : 20' 0" x 18' 0" x 19' 1"
Hearth Room (Cathedral): 16' 0" x 18' 6" x 23' 4"
Kitchen : 20' 0" x 10' 0" x 10' 0"